In fact it's nigh on impossible to look at the terrible fate that has befallen Hertha Berlin as anything else but divine retribution for sins committed in a former life. Or last season, to be more accurate. Supporters of the Spreesiders will probably violently shake their heads in disagreement at this point, but this column has still barely recovered from witnessing one or two Hertha matches in 2008-09, when they played (if that is indeed the right word) a brand of football so dull, negative and downright misanthropic that one opponent after another lost the will to live. By the end of the campaign the whole Bundesliga was ready to commit hara-kiri, just to make the pain go away. Forget Jorge Valdano's notorious quip about Rafa Benítez's less than aesthetically pleasing Reds: you couldn't see the pitch for all the excrement in the Olympic stadium. This year, it's more or less the same. Tedious but very competent catenaccio with excellent results has turned into slightly less tedious general incompetence without results. 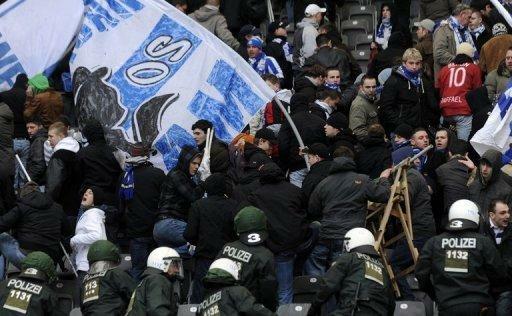 To address your query regarding Hertha supporters -fans rioted in March, when Hertha lost a crucial match to Nuremberg. But, honestly, I don't know if that incident squares with Hertha's reputation, or if perhaps if this is just typical football-guys gone wild. I am a little creeped out by the "Hertha girlfriend" subsection of the club's page for female fans. Not for fans of women's football. Hertha does have an LGBT fan club - as does Barça, Man City, and a few other clubs who reach out to gay and lesbian supporters. This brings me to your question - who is Berlin's Barça? : No side in Berlin - or anywhere - has managed Barça's ability to "brand" its progressive reputation. And as to Berlin's Lazio - at least one Berlin-based club draws more than its share of fascist fans (Dynamo - formerly the Stasi's team). But of course it isn't the high profile club that Lazio is and seems to have tried and failed to wiggle out of its terrible history and dubious present (by changing its name, then changing it back). The media tag line regarding Hertha's decline focuses on Berlin as now the only European capital not to have a team in the country's top flight division. But Berlin's reputation as a European capital has always been that of an atypical capital - a capital of atypicality. The city's romance, as a tourist destination, is built on fantasies of cabaret life and spy romance. It's basically the only city in Germany many of the alternative set care to visit - and, drawn by the relatively cheap rent, lots of those folks stay. For example - check out at Türkiyemspor Berlin, playing in the unglamorous domain of regional football for a few years now. Türkiyemspor, founded by players of Turkish immigrant background, threatened to rise to the 2nd division in 1990-1991. Their campaign was ruined by an administrative error (read the history on the club's site). In an incident recalling Germany's attitude towards the workers it recruited from Turkey in the 1960s (Come! - a generation later: Leave! ), a player who'd transferred to the club was mistakenly ruled ineligible and the games in which he'd played were either forfeit or replayed. The club just missed being promoted. The German national FA later apologized for the mistake (!). Things went downhill from there. But the club is still around, and it has a women's team (actually, I think it has three). 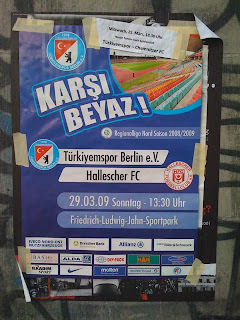 When in Berlin last year, I was supposed to attend a match between Türkiyemspor and Hallescher FC - it was postponed, ostensibly due to inclement weather but probably due to fears of violence from Hallescher FC fans, notorious for their racism. "I was just so angry, I didn't care. I could have been killed but I had to do something," Ogungbure told SPIEGEL ONLINE last week. "I thought to myself, what can I do to get them as angry as they have made me? Then when I lifted my arm I saw the anger in their faces and I started to laugh." "I've faced some sort of racist abuse at about half the matches I've played," he said, but the spitting was too much on March 25. "I've never seen anyone spit at a dog or a cat in Germany -- why should I be spat at?" Anyway, Berlin has lots of clubs not playing in the Bundesliga - and some of them, like Türkyemspor do interesting political work - to find them one needs to follow the love, not the money! I'm not sure they'd qualify as Berlin's Barcelona, but I think 1. FC Union Berlin probably deserves a mention - in contrast to Dynamo if nothing else. I don't know much about them except what I've gleaned from this article and Wikipedia, but any fans who can sing "the wall must fall" when they know the Stazi is watching them has to get points. They've apparently remained true to those traditions, severing ties with a sponsor last year when it came out the company's chairman used to be a Stazi agent. And depending on your definitions, it may not be fair to equate "kult" clubs with progressive, but surely Hamburg's St. Pauli falls into both categories. And they're going up to the 1st Bundesliga next year! Put the link on my Facebook page so people can read your brilliance!!! Yes - I started off writing about FC Union Berlin, but the post was getting so long, which is out of wack with what I know about men's soccer in Germany! Thanks Nick! "No side in Berlin - or anywhere - has managed Barça's ability to "brand" its progressive reputation." This is only partly true. Though not as inclusive as Barca, Inter Milan does have a "lefty" reputation with rradical poetry reading and outreach to leaders like Venezuela's Chavez. Compared to the facist AC Milan they are a fresh of progressive fresh air. Hi GatG - yes, this is true - perhaps I should have written 'capitalize from' instead of 'brand'!